Some knowledge of assembly language will be helpful. I've admired Zachtronics' complex, coding-based strategic games for a long while now, and by 'admire' I absolutely do mean that I'm too stupid to play them myself. Or perhaps I'm just daunted by the enormo-manuals and terrifying screenshots, and Zachtronics' latest, SHENZHEN I/O, does nothing to dispel that. But boy, am I tempted to pick it up, print off the manual and dive in. 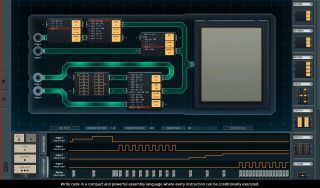 The game, due out in Steam Early Access on October 6, invites you to build circuits and write code, in a "compact and powerful assembly language where every instruction can be conditionally executed". There's a 30+ page technical manual, and even a "brand-new twist" on Solitaire, so you can play a game in the game when the game becomes too challenging. Zachtronics' back-catalogue includes Spacechem, TIS-100 and Infinifactory, which Chris Thursten liked to the tune of 93% last year.